When you cook, there's a lot of finagling that goes on. Chop this, pitch that. Saute this, trash that. It can turn into an hours-long process. 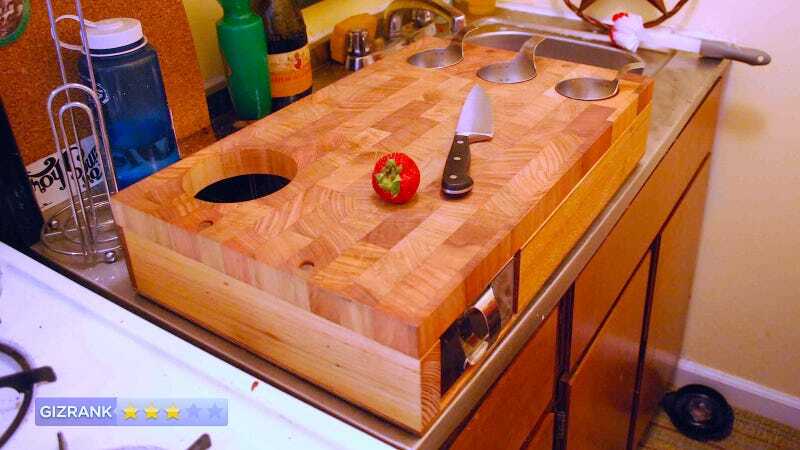 With the Workbench Cutting Board, Curtis Stone created what should be a time-saver. But strangely enough, it's not all that usable. A cutting board married with several kitchen utensils. People who cook and have giant apartments to store tons of crap. Made out of Victorian Ash, it's a good looking hunk of wood, containing three cup-sized wells to scrape your veggies into as you work. There's also a giant drawer where you can throw skins, stems, and other things you'll want to trash later. At 22-by-14 inches, It literally took up my entire counter. It's also pretty tall, so if you have high counters, it's hard to get a good angle on say, mincing an onion. It's so large that its size is actually a deterrent from using it. Despite some flaws, the inclusion of the cups and the trash bin make it convenient if you're preparing something with a lot of steps. I made this Moroccan tomato soup which required me to dice up about six tomatoes. It's heavy. So heavy that it's really hard to store. It comes apart into several pieces, not unlike a shoe box—there's the top part, which is the actual cutting board and the bottom well which houses the measuring cups and dumpster. There's a ton of unused space in the bottom, and it's so big that it makes it awkward to put back together and awkward to clean. The embedded measuring cups are a good idea in theory, but they're too small. There's really not enough room to house all the ingredients you need for one dish. And the irony is, it's a really big product, so its creators could conceivably have double the capacity. But they didn't. I used a set of Wustof knives. It's also worth pointing out that my kitchen is really small. The idea behind this thing is really amazing, but it borders on something you can buy off a late-night infomercial because of its usability issues. Honestly, this is a product my grandmother would order off TV, and I'm pretty sure she has bought something similar before. And it has a $300 price tag. So unless you have a huge kitchen, counters sitting at a perfect height, and money to burn, no.